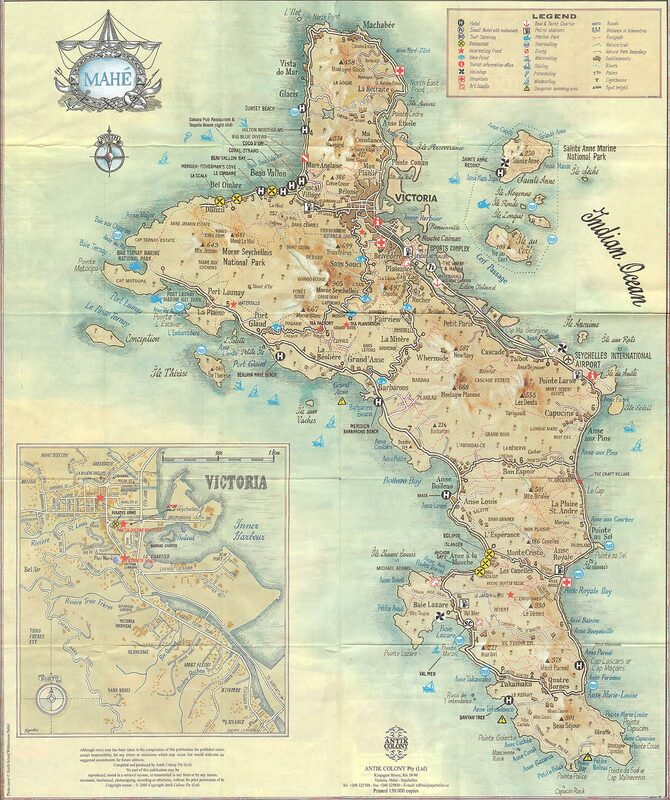 Posted on 05/15/2018 by Lesli W.
Mahé is a booming metropolis compared to La Digue, and I’ve booked us at the lovely Sans Souci guest house, set in the jungly hills above Victoria. It’s something to look forward to, after the day we’ve just survived. The tummies are feeling better, tho we’re clearly wrung out as we board the early ferry and land back in Mahé. An effervescent Jeanine greets us when we arrive at the guest house. We’re given a map, some general suggestions on how to spend the day, and keys to one of their guest cars. The weary adventurers have survived the worst of the food poisoning, and we’re back on track for a last day of exploring: a hike to the top of the island and then some lunch and a swim before C needs to be at the airport for his flight this evening. Oh, and they drive on the left here, roads vaguely marked by random signage and large boulders. Let’s go exploring, as they say. We drive up to the trailhead at Morne Blanc, opening the way to the second-highest point on the island. It’s a natural staircase of sorts, lined with lush jungle that elevates us from rainforest to cloudforest in the time it takes to climb to the top (667 metres). The view of the west side of the island is lovely; pristine beach sprawls below, less industrial than Victoria’s shipping port and industry. We follow the windy mountain road, Chemin Forêt Noire, down to see what sea we can see. Adventure points: 1 for driving jungle roads, on the left side. 1 for the hike up to the top of Morne Blanc (0 points for realising Morne Blanc means “dull white.” I have no idea why it is called that, because the view of this side of the island is fantastic!). 1 point for more aqua hiking in waist-deep waters to the island. Roadside view near the end of the road on the northwest side of Mahé. It’s not ugly here. We head back to the guest house for a siesta before C goes to the airport. I’m anxious now, both for airport goodbyes and the fact that I’m due to navigate (on the left) back to the guest house, on my own, in the impending darkness. But it goes well and award myself 1 adventure point for making it all the way to Victoria from the airport without getting lost (NB: it’s a straight line). This cockiness is short-lived because I subsequently receive -362 adventure points for getting profoundly lost, almost running out of gas, going the wrong way down a 1-way street, and getting directions from a toothless drunken woman before finally managing to navigate to the correct exit off the roundabout to go in the proper direction to get up the jungly winding roads in the pitch blackness of the night, only to be an hour late to dinner with the lovely folks at the guest house. I shouldn’t be allowed to drive in uncharted territory without a co-pilot. The new day finds me navigating (correctly, this time) to the Sir Selwin-Clarke Market in Victoria and taking a wander about town. If I’m honest, the spice market in Stone Town, Zanzibar is much more interesting and I’m finding myself wishing we were back on charming La Digue for this last day. I even managed to find a Hindu temple here! Regardless, it’s good to see the downtown and have some downtime in the afternoon to get organised for my trip back home. Time flies, as they say (NB: the least problematic item of the Mahé experience was driving on the left). I’ve planned a stopover in Istanbul to break up the two long segments of my journey home, and I’m staying at the adorable Empress Zoe B&B once again. Location meets character: it’s literally around the corner from the 4Seasons and even has resident cats! It’s not quite 5am when I arrive. I’m greeted by foggy, empty streets as the Adhan, the call to prayer, sounds. It’s an exquisite, almost intimate welcome back to the neighbourhood with its cobblestone streets and winding alleys. At once I feel at home and excited to explore this city once more. My goal for the short time I have here is to cross the Galata Bridge and climb to the top of the Medieval Galata Tower to see the city from that perspective. The spring rains break for long enough for me to walk from my B&B in Sultanahmet (near the Blue Mosque and Ayasofya), through the city and to the waterfront. I like this city, its old stone architecture and elaborate mosques juxtaposed against the bustle of one of the most important cities in this part of the world. East meets West in every way imaginable. Mission: accomplished, and I see the city from up high, disappointed that this beautiful old stone tower is now not more than a restaurant with a (really crowded) observation deck. Regardless, it provides a fantastic panorama of the city, both the European and Asian sides. I wander the city, revisiting the Mısır Çarşısı (spice market) and the Grand Bazaar, wending my way to the fantastic fish place I had dinner at last time. 20km or so on the legs, dozens of photos on my camera. A brilliant way to spend a stopover! In the morning, there’s just time for brekkie and a wander around the neighbourhood before my taxi brings me back to the airport for the looong flight home. As we navigate through traffic, I contemplate the trip and the amazing variety this brilliant planet has to offer. In the past 12 days I’ve travelled over 15,000km, been on 3 continents (and seen a 4th across the Bosphorus) seen spectacular beaches with tide-carved granite obelisks, encountered animals not found elsewhere on earth, witnessed first-hand the effects of global warming on our oceans, watched a white-spotted moray eel swim beneath me as I snorkeled, wandered past centuries-old stone buildings, sat under mind-blowing night skies, walked the streets of an ancient city bustling in a modern world, hiked in lush rainforest, driven on the left-hand side of the road, spoken two languages and heard least a dozen more, ridden a bike in a bikini, sampled a rainbow of foods and drink, seen a rainbow, and shared laughter in tropical rains while feeding a gentle beast that was (conceivably) conceived in the 19th century. This entry was posted in Africa, Travel by Lesli W.. Bookmark the permalink.